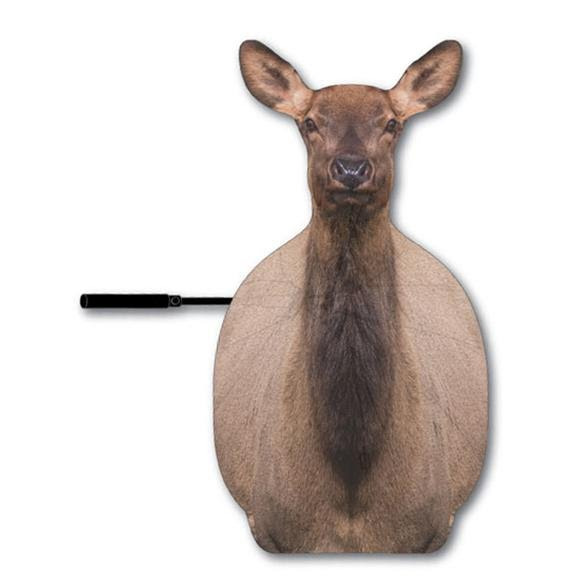 The ElkFan is designed as a mature cow elk decoy. Calming, and intriguing the curious nature of other elk. Allowing a hunter to close the distance in many situations. Designed to fool the most weary of animals, even the ones that won't be fooled by one dimensional decoys. Built to be hands free when taking the shot. The ElkFan is designed as a mature cow elk decoy. Calming, and intriguing the curious nature of other elk. Allowing a hunter to close the distance in many situations. Designed to fool the most weary of animals, even the ones that won&apos;t be fooled by one dimensional decoys. Built to be hands free when taking the shot. Traditional hunting - while set up at a distance from the decoy, wait on an incoming Elk, lured in by the decoy drawing his attention off of you to make a shot in close quarters. Locate and set up - Many times elk hunting requires moving through open spaces to get into position, now doing so without spooking animals just got easy. Spot and stalk - moving quietly through the dark timber behind the ElkFan greatly increases your odds of getting with in shooting distance. More times than not spot and stalk hunting ends up with the elk spotting the hunter first and heading over the mountain in the other direction. When being spotted with the ElkFan, your just another elk on the mountain, which keeps them calm allowing you to move into position for a shot. Measurement Closed: 33" x 4.5" x 2"